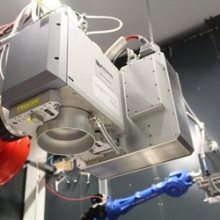 As the technology leader for intelligent laser welding solutions, Blackbird Robotersysteme GmbH is participating in a research project that intensively explores optical coherence tomography’s potential for remote laser welding in auto manufacturing. The Technical University of Munich’s Institute for Machine Tools and Industrial Management (iwb), together with multiple industrial partners such as BMW and OCT sensor maker Precitec, are investigating innovative technology for more flexibility in body construction, particularly electro mobility. Germany’s Federal Ministry of Education and Research sponsors the project under the ‘Photonics Research Germany’ research incentive program. The German government’s clear goal is to advance electromobility. A look at the causes of very disappointing electric vehicle sales to date shows for example inflexible production structures which do not allow cost-efficient manufacturing of smaller volumes. Future-proof production systems and bonding techniques need to work flexibly, adaptively and with connectivity. To maximize efficiency and autonomy, machines will require much more information about their surroundings and the objects to-be-processed. This is precisely where contactless methods such as OCT, combined with photonic sensors, offer tremendous potential for detecting orientation and status, assessing process results, and sharing and documenting this information within the manufacturing process. Further development of these industrial advantages is the goal of the research initiative ‘Photonics for Flexible, Networked Production’ and particularly the research project ‘Robot-Supported, Scanner-Based Optical Coherence Tomography in Remote Laser Welding for Process Chain Flexibility in Body Construction’ (RoKtoLas). Project partners BMW AG, Blackbird Robotersysteme GmbH, Precitec GmbH & Co. KG, Emil Bucher GmbH & Co. KG, applicationtechnology GmbH & Co. KG and the Technical University of Munich’s iwb are seeking an innovation leap through alternative bonding technology for raw body construction. The research project is sponsored by Germany’s Federal Ministry of Education and Research under funding code 13N14551 and supported by the VDI Technology Center. The project utilizes a Blackbird scan solution consisting of an intelliWELD PR scan head from affiliated company SCANLAB, a ScanControlUnit and an OCT scanner. The integrated OCT technology employs single-point high-speed distance measurement based on interferometry. Imaging relies on ultra-fast workpiece scanning with a dedicated OCT scanner coaxially coupled in the weld scanner. This welding solution thus provides integrated edge tracking and seam topology measurement. Unlike other measurement methods, OCT-based distance measuring can acquire and evaluate detailed data with full flexibility ahead of, within and past the actual laser process zone. This includes, for example, individual analysis of the to-be-welded components and seam tracking of fillet welds, as well as exact detection and parameterization of potential weld defects or imprecision during the weld process. Such data allows assessment of seam quality as well as detection and recording of defects such as inadquate width, penetration, open pores and faulty positioning. This data can be used in a clock-period-neutral manner for quality assurance procedures that eliminate the need for downstream quality assurance steps. For more information, please visit https://scanlab.de.